OBJECTIVES: To determine the efficacy and safety of adjunctive corticosteroid therapy in clinical Pneumocystis jiroveci pneumonia (PCP) in infants exposed to HIV infection. DESIGN. Double-blind randomised placebo-controlled trial. METHODS: Infants with a clinical diagnosis of PCP, based on an 'atypical' pneumonia with: (i) hypoxia out of proportion to the clinical findings on auscultation; (ii) C-reactive protein count less than 10 mg/l; (iii) lactate dehydrogenase level above 500 IU/l; (iv) compatible chest radiograph findings; and (v) positive HIV enzyme-linked immunosorbert assay (ELISA) were included in the study. Patients were randomised to receive either prednisone or placebo. The protocol provided for the addition of prednisone to the treatment at 48 hours if there was clinical deterioration or an independent indication for steroid therapy. Other treatment was carried out in accordance with established guidelines. The primary study endpoint was in-hospital survival. Secondary outcome was time from admission to the first day of mean oxygen saturation above 90% in room air. RESULTS: One hundred patients were included, 47 in the prednisone and 53 in the placebo group. 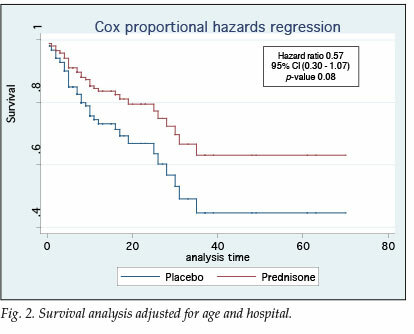 Patients in the prednisone group had a 43% better chance of survival than the placebo group (hazard ratio (HR) 0.57, 95% confidence interval (CI) 0.30 - 1.07, p=0.08). No significant differences could be demonstrated between groups with regard to other parameters of recovery. 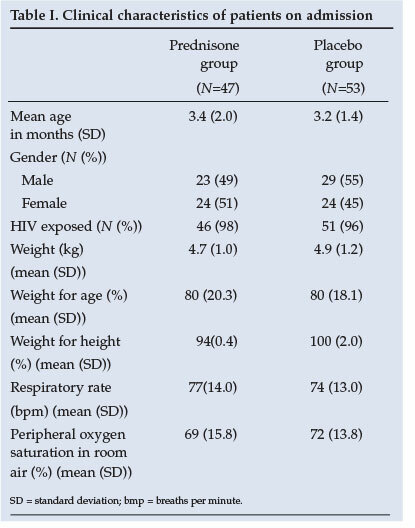 CONCLUSIONS: In HIV-exposed infants with clinical PCP, adjunctive corticosteroid treatment does not appear to add benefit regarding time to recovery or oxygen independency, but early administration may improve survival. A large multicentred trial is needed to confirm these findings. Pneumocystis jiroveci pneumonia (PCP) is an important pathogen in HIV-infected infants with severe pneumonia.1 PCP was found in 16 - 51% of HIV-positive African children who died from respiratory illness, being the most common cause of death in HIV-infected infants less than 6 months of age.2 In a prospective South African study3 to determine the cause of community-acquired pneumonia in infants, PCP was the AIDS-defining illness in 20% of HIV-infected children. The mortality rate was higher among those with PCP (47%) than in those without PCP (18%). Current recommendations for adjunctive corticosteroid therapy in cases of PCP,8 based on a review of randomised trials in adults, may not be appropriate in infants. The aim of the study was to determine the clinical relevance and safety of routine adjunctive corticosteroid therapy in cases of severe pneumonia clinically considered to be due to P. jiroveci in infants less than 18 months of age and exposed to HIV infection, in view of similar clinical, radiographic and laboratory findings (or co-infection) with CMV pneumonitis. A double-blind randomised controlled trial was conducted among infants less than 18 months of age admitted with severe pneumonia clinically considered to be due to P. jiroveci at Pretoria Academic, Kalafong and Witbank hospitals. The study period was from 1 February 2005 to 31 March 2006. The admitting doctor enrolled the patients according to study protocol. A clinical diagnosis of PCP was made in patients with 'atypical' pneumonia with the following features: (i) hypoxia out of proportion to the clinical findings on auscultation; (ii) C-reactive protein (CRP) count less than 10 mg/l, or low; (iii) lactate dehydrogenase (LDH) level above 500 IU/l; (iv) bilateral perihilar interstitial infiltrates on chest radiograph (CXR), compatible with a diagnosis of PCP; and (v) positive HIV enzyme-linked immunosorbert assay (ELISA). At the time of commencement of the study, specific antiretroviral treatment was not available in South Africa, and HIV polymerase chain reaction (PCR) testing was not performed routinely. HIV infection was not necessarily confirmed in all participants, and therefore patients with a positive ELISA test were deemed HIV-exposed rather than HIV-infected unless HIV PCR confirmed infection. Ethical approval was obtained from the Research Ethics Committee of the University of Pretoria. The parent(s) or guardian gave informed written consent for participation in the study and for HIV testing. The sample size had to be restricted to 100 patients because of time and financial constraints. A random number generator was used to determine the allocation to steroid or placebo treatment, which were provided in a double-blind fashion by the hospital pharmacists according to study number. Patients received either prednisone 2 mg/kg/day or placebo for 7 days. The protocol provided the addition of prednisone to the treatment at 48 hours if there was clinical deterioration or an independent indication for steroid therapy. Standard antibiotic regimens including co-trimoxazole were carried out in accordance with established guidelines. The following baseline investigations were performed on admission. 2. Full blood count, differential count and platelets, CRP, LDH, total protein and albumin, aspartate aminotransferase (AST) and alanine aminotransferase (ALT), CD4 count, blood culture and HIV ELISA. HIV PCR on a subset of patients followed only after the initiation of antiretroviral treatment as explained above. 3. Nasopharyngeal aspirates for respiratory viruses including CMV and PCP immunofluorescence were collected. 4. Induced sputum was collected for PCP PCR on a subset of patients. 5. A pp65 antigen for CMV in peripheral blood had to be omitted because of cost and lack of resources. Daily monitoring included clinical examination, recording of temperatures, oxygen saturation and oxygen requirement, and development of new features. The number of days to achieve mean oxygen saturation above 90% in room air was recorded. Where patients were still hospitalised on day 7, follow-up induced sputum and nasopharyngeal aspirates were collected. The primary study endpoint was in-hospital survival. Secondary outcome was time from admission to the first day of mean oxygen saturation above 90% in room air. All findings were recorded on a standardised data collection sheet. A senior registrar from the Radiology Department of the University of Pretoria evaluated the CXRs of participants in a systematic, standardised manner using adjusted scoring systems.10,11 Scoring systems were adjusted in the following manner: (i) each lung field was divided into 4 equal quadrants; (ii) the left lower medial quadrant was excluded from the scoring because the heart often obscures the lung field in that quadrant; and (iii) each quadrant was then scored on a scale of 0 - 3, with a maximum score of 21 (0 = normal, 1 = subtle increased interstitial markings, 2 = prominent interstitial opacities, 3 = confluent interstitial and acinar opacities). Cox proportional hazards regression was used for the statistical analysis. Intention to treat analysis (ITTA) was used as well as a treatment-only per protocol analysis (PPA); patients in the placebo group who received prednisone after randomisation were disregarded. The Cox proportional hazards assumptions were checked. The log-rank test was used to compare the survival curves between the treated and placebo groups. A p-value <0.05 was used to determine statistical significance. A total of 100 patients with a clinical diagnosis of PCP were included in this study. Respective outcomes for the prednisone and placebo groups, as well as those patients whose clinical condition warranted additional corticosteroid treatment, are depicted in Fig. 1. Similar baseline clinical characteristics of the two groups are shown in Table I. The baseline investigations as well as CXR results reveal no significant difference between groups (Table II). The yield on the nasopharyngeal aspiration investigations was very low and a specific aetiology was proved in only a few cases. Statistical analysis revealed no difference between groups in terms of age, severity of illness, duration of hospitalisation or co-morbid conditions. In terms of survival the ITTA and PPA results were similar (Table III). Fig. 2 demonstrates that patients in the prednisone group had a 43% better chance of survival (95% confidence interval (CI) 0.30 - 1.07, p=0.08). PCP is common among HIV-exposed infants with a high morbidity and mortality. Current recommendations for adjunctive corticosteroids in PCP are based on adult studies only and may not be appropriate in that these could worsen the outcome when co-infection with CMV is present in infants. 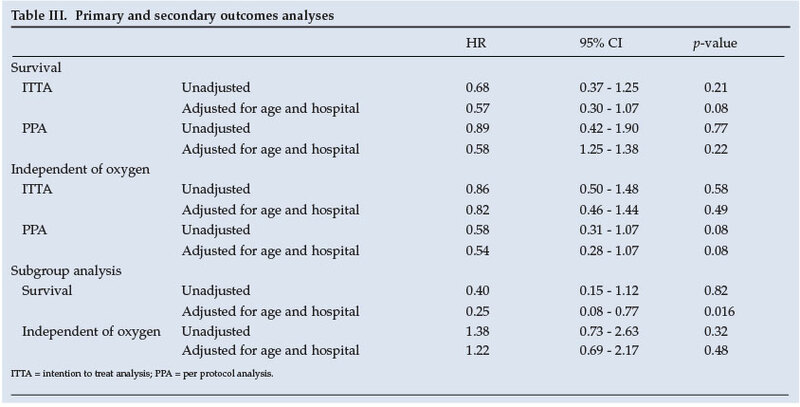 The objective of this study was to determine the clinical relevance and safety of routine adjunctive corticosteroid therapy in cases of clinical PCP in infants. There was no significant difference between the prednisone and placebo groups as a whole when comparing baseline characteristics or indicators of severity of illness. Adjunctive corticosteroid treatment had no impact on time to recovery or oxygen independency. 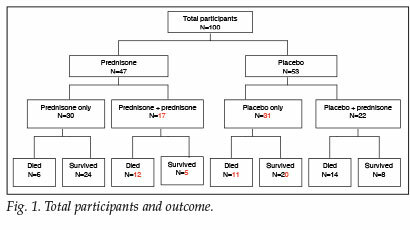 Survival, however, seemed to be improved (hazard ratio (HR) 0.57, 95% CI 0.30 - 1.07, p=0.08), despite a large part of the placebo group receiving additional corticosteroids, as provided for per protocol. When considering those patients who required additional corticosteroids more closely, two clinically distinct groups of patients can be identified. The first group presented with more severe and advanced disease - higher respiratory rates, lower peripheral oxygen saturation on admission and increased clinical severity of disease, which prompted the attending doctors to prescribe additional corticosteroids within 24 hours. These patients, both in the prednisone and placebo groups, often died within the first day or two after admission. In this group of patients adjunctive corticosteroid treatment did not seem to play a role. In the clinically less ill group, however, retrospective subgroup analysis shows that corticosteroids did not significantly improve time to recovery or oxygen dependency, but survival did seem to be improved significantly (HR 0.25, 95% CI 0.08 - 0.77, p=0.016). The lack of statistical significance may be due to our small study numbers, and is a limitation of the study. The study should be repeated in a large multicentre trial to confirm the findings. In HIV-exposed infants with clinical PCP, adjunctive corticosteroid treatment does not appear to add benefit regarding time to recovery or oxygen independency, but early administration may improve survival. A large multicentre trial is needed to confirm these findings.